Come along to the Hexham Middle School and Transition Tynedale summer social event on 30th June at 4:30pm. 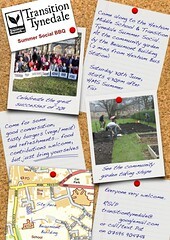 Held at the community garden by the Beaumont Building, just 2 minutes up from Hexham Bus Station. It’s straight after the middle school Summer Fair which runs from 2:00-4:00pm. Come along for some good conversation, tasty burgers (vege and meat) and refreshments. Food contributions are very welcome, but just bring yourselves! ‹ PreviousWhat is your vision for sustainable Hexham?